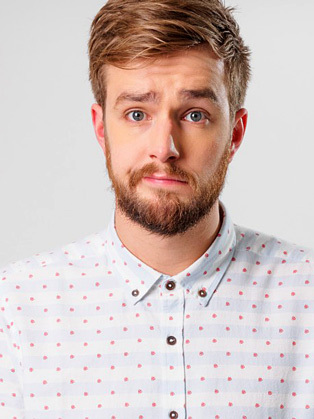 Iain Stirling is a Scottish stand up comedian. Having started stand-up whilst in his final year of Law at the University of Edinburgh, a year which saw him make the final of both the Paramount Funniest Student and Chortle Student Comedian Of The Year competitions, he is now a regular on the UK comedy circuit. Having been dubbed one of Scotland's 'Hottest Newcomers' by The Scotsman after his performance in front of 750 people at the Glasgow Fruitmarket, Ian Stirling now gigs all over the UK including The Stand (Glasgow and Edinburgh), The Comedy Store (Manchester and London), Off The Kerb and various smaller clubs. Stirling also appeared in a singing contest in 2002. In August 2009, Iain performed in the final of the Chortle Student Comedian Of The Year at the Edinburgh Fringe Festival, finishing runner-up to winner Joe Lycett. In 2012, he made an appearance on Russell Howard's Good News Extra. Since October 2012, he has been touring with Russell Kane as a warm up act for Posturing Delivery. After being spotted at a gig, Iain has since presented the CBBC Channel along with his canine sidekick Hacker T. Dog from the CBBC TV show Scoop, and other sidekicks including Dodge the Dog, 'The Toad of Wisdom', and 'Pig With 'Tasche'. He has also worked as a writer on a number of projects for the likes of CBBC and BBC Scotland. He also appeared in Scoop as the postboy in the first four episodes of the new series. Iain presents CBBC's show, Help! My Supply Teacher's Magic – the show puts magicians in schools and tricks children into thinking they are teachers. Stirling also presented 12 Again, a show in which celebrities talk about what they were like when they were twelve. Stirling also co-presents All Over the Place. On 1 February 2013, Stirling left the CBBC office but returned in September 2015 for CBBC's 30th anniversary. In early October 2013, Stirling began recording for a new series for CBBC, The Dog Ate My Homework, which was commissioned as the CBBC answer to Mock the Week. The show features two teams of comedians or celebrities and a child as team leader. Stirling hosts the show of 'off-the-wall questions, nonsensical studio games, and slapstick challenges'. He was nominated for a BAFTA in 2014 for best children's presenter for his hosting of the programme for two series. In 2015 he returned to CBBC to celebrate 30 years of the channel in Hacker's Birthday Bash. In June 2015 he became the narrator of ITV2 reality series Love Island, which returned for a second series in May 2016 and a third in 2017. In 2016 Stirling starred in Comedy Central series Drunk History. He occasionally appears as a TV & film reporter on ITV's weekend morning show Weekend. He presented CelebAbility, a six-part entertainment series for ITV2. On the 18th of November 2017 Stirling appeared on The Jonathan Ross Show.